Story time: Not long ago I came in from feeding our Nigerian dwarf goats and our flock of chickens. It was pouring rain, my boots were covered in farm…stuff, and as I came in that back door and saw the pile of boots and dirt gathered there I realized something. It’s time to reclaim the idea of a mudroom. Down with the white perfection that will never see a speck of dirt! Unless you are living the Beverly Hills life, let’s talk real. As in real messy. 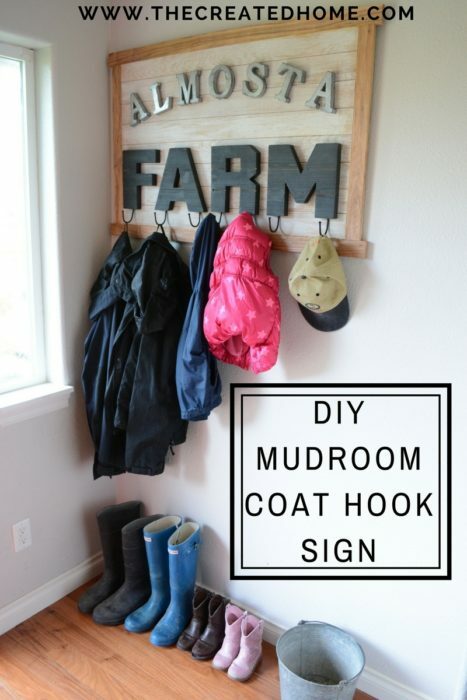 I want a mudroom that isn’t afraid to get dirty, that wipes clean, and that says “Screw the Pinterest perfect image,” and takes on all that muddy kids and dogs can throw at it without breaking a sweat. This is part one of a four part mudroom makeover. I’ll share what the other parts will include down below. I’m a big fan of dual purpose builds. This sign is both fun and functional, and you can easily customize this to say anything you like. We call our little suburban farm “Almosta Farm,” and love the idea of having that name up on a sign. The coat hooks are a great landing space for coats, hats, dog leashes, and other paraphernalia. *This blog uses affiliate links. You can read my disclosure statement and learn more here. My sign measures about 35 inches across and 22 inches tall and is constructed using scrap flooring pieces. Join the boards using pocket hole joinery, and trim them once they are all connected to square up the sign. If you want to opt for a shiplap look one way to do so is to run your circular saw down the boards with the blade down only about 1/8″. Whitewash, paint, or leave the board as is. I chose to dry brush the board with white paint. Cut your own letters or purchase them. Frankly, I rarely find it’s worth the time it takes and Michaels has some rocking sales. So there’s that. That said, I didn’t much care for the look once I got to this point, so I sanded them. And then I still wasn’t love, so I painted them. Sometimes in DIY you just have to roll with it and find what works best. I chose to overhang the top and bottom pieces, for a most rustic look. Not sure rustic is the right word here, but let’s go with that. Isn’t that reclaimed pecan wood just awesome?! This is not structural, so it’s fine to just glue it to the board. I attached some simple, inexpensive hooks to the backs. You will need to recess them so that the letters will sit flush to the sign. Trace the part of the hook that will need to be recessed into the letter, then gently tap the chisel along the pen lines to remove the material. It doesn’t need to be perfect, just enough to seat the hook top down into the wood (or MDF). Glue the letters to the board using wood glue and epoxy (for the metal letters, if you use them.) Hang the sign using a french cleat. Hang yer stuff! And don’t forget to share your version of this coat hook sign. The next parts of this mudroom will be a fold down bench and a large tile tray under that sign. The final step will be a locker cabinet area to the right of the sign and bench. Be sure to follow along so you don’t miss out! Very well made! Seems like a really great DIY project. Totally agree that with DIY, it’s not complete unless you’re in love with it. I also like that you used different woods for the backer and the frame. Would love to try this out soon.